In our society, we live by time machines. The clock awakens us each morning, regulates our day, signals sleep when the day is done, and drives us crazy on NFL Sundays. Time for humans is an analog clock with a face and hands or an electronic device with digital numbers. Nature has a different system. In nature, there are no numbers. Time is dictated by the sun. At Green Spring Gardens, the Master Gardeners, with help from Boy Scout Troop 1128 of Vienna, have created a garden for children that celebrates time and the sun. In the center of the garden is an interactive sun clock. It’s made of cement stepping stones with numbers outlined in mosaics and tiled stones that represent the months of the year. 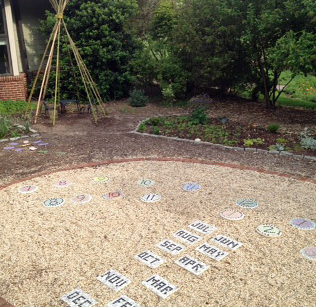 Children visiting this garden learn about time from the sun as our ancestors did. They stand on the stone for the current month, raise a hand high to become the device’s analog and let their shadow fall on the correct time. Daylight savings and regular time are both displayed on this sun clock. Children also can tell time by the flowers in this sun garden. The Children’s Garden is planted with morning glories which open as the sun rises; sunflowers that look skyward and move as the sun arcs across the sky; multicolored four o’clocks that awaken in late afternoon to brighten up a dark corner; evening primrose that heralds day’s end with a bright yellow flower; and the moon vine, a flower that sleeps all day and unfolds into bright whiteness when the sun slips under the horizon. In addition to the sun clock, the Children’s Garden has a teepee that will be covered in bean vines by summer and a sensory garden that excites touch, smell, sound, and sight. Imagination flies at the garden as children take off on new adventures while hidden under the vines of purple string beans and pretzel beans. Scented geraniums, fragrant thyme and chocolate mint add to the taste of the air, while strawberries and jelly bean blueberries add flashes of color. Like any garden, it grows and changes with the passing of days, so it can be worth several visits. This summer, take some of that time we’ve been talking about and spend it in the children’s garden at Green Spring Gardens. Come and enjoy an afternoon with your children and celebrate time, the sun and the beauty and fun that nature provides. The Children’s Garden is one of more than 20 thematic, demonstration gardens at Green Spring Gardens, 4603 Green Spring Road, Alexandria, Va. Author Pamela Smith is the Community Horticulture Program Coordinator at Green Spring Gardens. This entry was posted in Uncategorized and tagged Alexandria, Green Spring Gardens, horticulture on May 28, 2014 by Fairfax County Park Authority. It sounds like a wonderful adventure wish we lived closer to the children’s garden!We hope many children come to experience this magical place. Enjoy!